From the Apostles the office of the Priesthood passed on in an unbroken chain to the first clergymen whom they ordained, and through them to their successors. This is called Apostolic succession and it is fundamental teaching in the Orthodox Church because only through it can the clergymen receive the authority to become real representatives of Christ and the Apostles of the Church. As successors of the Apostles and representatives of Christ in His Church, clergymen continue the work of Jesus. They teach the word of God; offer the Holy Eucharist and administer the other sacraments; they govern the Church and take care of the spiritual needs of the members of their congregations. There are three orders of the Priesthood: the order of the Bishop, of the Priest and of the Deacon. The first and highest order of Priesthood belongs to the Bishop (the Episcopos). The name Episcopos was given to the successors of the Apostles (Acts 20:28; 1 Timothy 3:1-2; Titus 1:7) and means "Overseer." He is also called the Archpriest or Archierefs, which distinguishes him as being chief over the priests of a specific territory. All bishops are equal among themselves as they hold the same degree of priesthood, but there are grades in their titles, depending on their administrative power. For instance, the title of Metropolitan is given to a bishop of a great or capital city. The title of Archbishop is given to the chief or first among the bishops of a large area. The title of Patriarch is given to the chief among the Bishops. The second order of the Holy Priesthood is occupied by the Priest. The priest is in charge of a community which he spiritually serves. He administers all the sacraments with the exception of the Sacrament of Holy Ordination, and celebrates all the church services with the exception of the ceremony connected with the consecration of a church. He leads the community in prayer and blesses them in the name of the Lord. The Deacon holds the third order of the Priesthood. The word Deacon (Diakonos) means "assisstant," (Matthew 20:26; Acts 6:1-7) and he assists the bishop or the priest in the celebration of the sacraments and church services. During services the Deacon recites the litanies, the Gospel readings and other prayers and assists the celebrant bishop or priest in the sanctuary. In the Early Church, clergymen wore the same kind of garments when celebrating the church services as those worn by other people of that time. Even then however, there was a feeling that the garments of the celebrant clergy should be distinguished in some way from those of the laos (people). The feeling of reverence demanded that the garments of the celebrants should be festive, preferably white in color (a symbol of holiness and purity) and that they be decorated with crosses to distinguish them from ordinary garments. In the course of time, the fashions of the garments of people changed, but the garments of the celebrants remained unaltered and took on a symbolic meaning. They distinguished the officiating clergymen fro the laymen and at the same time reminded them all that the celebrants "are not of the world" (John 17:16) but participants of Christ's glory (John 17:22-24) clothed in the robes and the grace of the Holy Spirit. Each of the three degrees of clergy has its own special vestments. Although some are the same items for all three degrees, each higher degree has additional pieces not possessed by the degree below it. In general, some of the Bishop's vestments are different from those of the priest and the deacon, and some of the priest's vestments vary from those of the deacon. Rason: The Rason (Anteri, Cassock) was the garment of the Byzantine Empire. It was a tight-buttoned garment which had a belt at the waist. Orarion: This is a long, narrow strip of cloth, unique to the deacon, which the deacon wears on the left shoulder so that one of the ends falls in front and one in the back. When the Lord's Prayer is recited the deacon changes its shape, wearing it over both shoulders and around his waist crosswise so that both edges fall in front. The change facilitates the Deacon's movements during Communion. The Orarion is the Deacon's distinctive vestment. Holding one end of it with his right hand, he raises it slightly when he recites prayers. Symbolically, it represents the wings of angels, the servants of God, and thus signifies that it is the deacon's responsibility to be a servant of the Church. 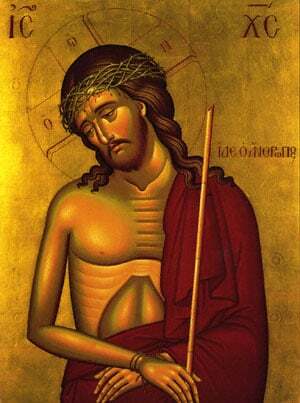 Great Omophorion: A long, narrow vestment worn over the sakkos and around the neck and shoulders. It is worn by the Bishop from the beginning of the Divine Liturgy until the reading of the Gospel, for he represents the Arch-priest, Christ, until this time. Small Omophorion: Worn after the Gospel reading until the conclusion of the Divine Liturgy because from that time on he is a simple celebrant and servant of the Lord. The Omophorion, both Great and Small, are usually decorated with the figure of Christ or that of a lamb and are symbolic of the stray sheep that Christ, the 'good shepherd,' carried on his shoulders. Engolpion: A highly decorated round or oval image of Christ or the Theotokos worn on a chain over the Omophorion. It is a sign of the purity of heart which a Bishop should possess. It is the official distinctive sign of the Bishop which he may wear at all times. When he puts on the Englopion he prays: "Create in me a pure heart, O God, a renew a steadfast spirit within me." Mitra: The Mitra (Mitre, Crown) is a luxurious head dress. It is decorated with small images of Christ and the four Evangelists within the frames of precious stones, and bears the cross on top. It symbolizes the glory of the Lord and the highest ecclesiastical authority which is given to a Bishop. Pastoral Staff: A tall staff of precious metal topped by two serpents with a cross in the center. This is a sign of the Bishop's authority. The serpents represent the visible and invisible enemies of the Church and the Cross symbolizes the power which Christ has granted to the Church and is entrusted to the Bishop. The staff also reminds us of the staff of Moses with which he led the Israelites to the promised land and the good shepherd tending to his flock. Mandyas: This is a long purple clock of royal splender. It covers everything but the head. Its many folds represent the power of God and the wings of angels. The train is usually held by a Deacon or Acolyte. It is worn at official ceremonies, but not during the Divine Liturgy. "No one caught up in the desires and delights of the flesh is worthy to come forth or draw near to minister to You, the King of glory; for to serve You is great and awesome even for the heavenly powers.... Therefore I implore You, as alone benevolent and quick to hear, look on me Your sinful and unworthy servant, and purge my heart and soul of an evil conscience, rendering me able, by the power of Your Holy Spirit, and invested with the grace of Priesthood, to stand before this Your holy table and consecrate Your pure and sacred Body and Your precious Blood...."